The family of Aiyana Jones, the 7-year-old girl accidentally killed by a Detroit police officer during a raid in 2010, has reached settlement with the city of Detroit. 7 Action News has learned that the settlement is for $8.25 million and was announced just days before the civil trial was supposed to begin. Prominent Detroit Attorney Geoffrey Fieger took up the civil case on behalf of the family and was expected to hold a press conference earlier this week, but the conference had been canceled. We'll be speaking with Fieger on Thursday afternoon. 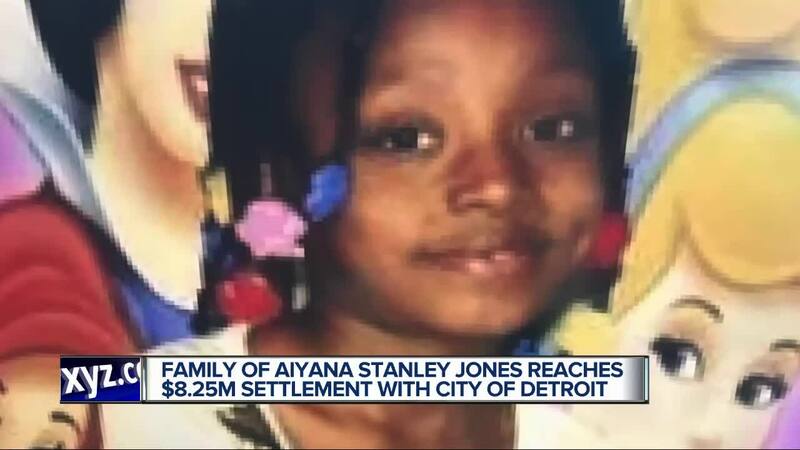 DETROIT (WXYZ) — The family of Aiyana Jones, the 7-year-old girl accidentally killed by a Detroit police officer during a raid in 2010, has reached settlement with the city of Detroit. 7 Action News has learned that the settlement is for $8.25 million and was announced just days before the civil trial was supposed to begin. Prominent Detroit Attorney Geoffrey Fieger took up the civil case on behalf of the family and was expected to hold a press conference earlier this week, but the conference had been canceled. We'll be speaking with Fieger on Thursday afternoon. The raid happened at a home in May of 2010 and Aiyana was shot in the head while she slept on a couch during the raid. Police were attempting to find a murder suspect at the home on the city's east side. Detroit Police Officer Joseph Weekley was charged in the case and had been tried twice for her death, but both trials resulted in hung juries. A judge dismissed involuntary manslaughter charges against Weekley in the second trial. After the second hung jury, Wayne County Prosecutor Kym Worthy said she would dismiss the final charge, a misdemeanor for careless discharge of a firearm causing death, and a third trial wouldn't happen. "To date, the City of Detroit has refused to participate in good faith in any resolution regarding Aiyana's death and continue to deny the family justice," Fieger said in a press release. "Aiyana's death was a tragic loss for her family and has been a heavy burden on our community," City of Detroit Corporation Counsel Lawrence Garcia said in statement. "We believe today's settlement is fair because it balances the needs of Aiyana's family and our responsibility for the city's finances. We hope this resolution will provide everyone involved a measure of closure." Detroit City Council still has to approve the settlement.